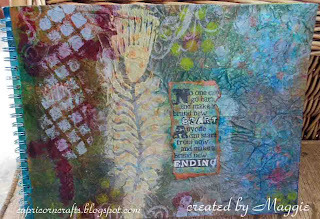 Well it has been ages since I have managed to get online to blog firstly we have been away and since our return life has been a little hectic to say the least, but when I saw the Craft Barn challenge to make an Art Journal Cover how could I refuse as this was where my AJ journey began.........and although I have not made any more pages since the last challenge :-( my journal needed a cover makeover and I had kept putting it off ........so yesterday I ignored everything that was going on around me and the *HW* that was shouting at me and went into my room of craft and got very messy and inky and had a fabulous morning. We had to use Masks/Stencils in the making of our cover, I will list my ingredients at the end of the post. I used brown paper that had been in a box as packaging and it was nicely crumpled, I sprayed with various colours of cosmic shimmer mists when covered I crumpled up the paper in a tight ball and squeezed......inky fingers now....... could have worn gloves but hey that's half the fun.... getting inky.....yes!! 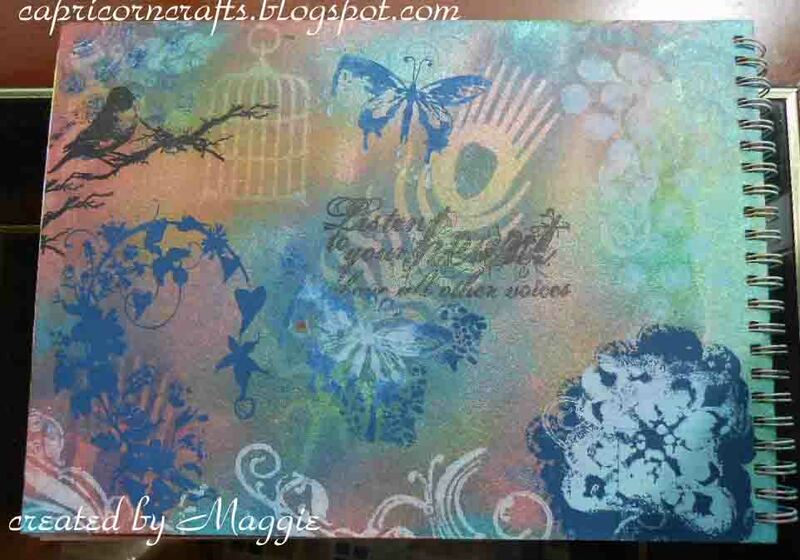 Paper was undone and left to dry, tried hurrying it up with heat gun but it was very wet......so I had to go and have a coffee and a rummage for masks and stamps.......can't make anything without my stamps....... so here is the finished result of the front cover. 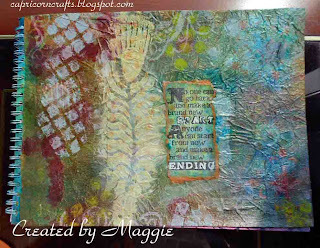 For the Feather mask I used Terra paste and when dry went over it with lake mist paint dabber when this was dry I used rusty hinge DI with the spot mask, loved the layers of texture, pale blue and denim paint dabber were used with the square mask, I carried on masking and spraying and dabbing and Inking........a little too much perhaps but I love the finished effect and I was having way to much fun to stop...lol!!! Sentiment was stamped onto card that had been sprayed (by mistake a happy accident on untidy desk......) with same colours and Tim Holtz stamps when everything was dry I used my piece to the cover up the front cover of my AJ which was thin card, to cover the inside of this cover I have used another piece of the brown packaging paper sprayed with same colours, I have left this undecorated for now and will go back to this at a later date. As I said before I was having great fun and found I couldn't stop here so I continued onto the back cover, now this was made of very heavy chipboard unlike the front which was thin card, so I sprayed directly onto this first and let dry. Then using the same masks I sprayed and Inked as before, I applied Ranger paint dabbers to the Tim Holtz stamps in various colours stamping bird and sentiment in Black Archival. The finished cover is sooooo different to the front I love how they have turned out. I have ended up with two completely different covers using more or less the same ingredients and I had great inky fun, thanks for the challenge Izzy. 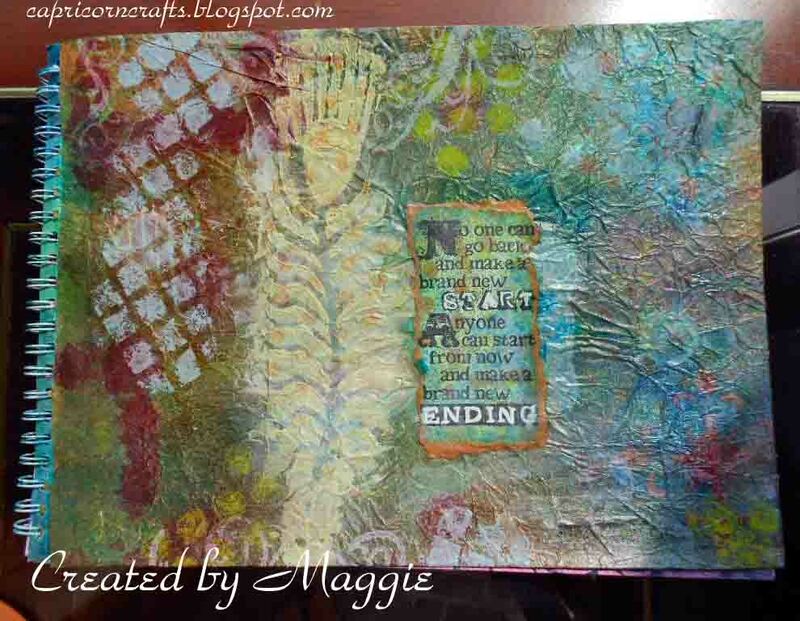 Fabulous Maggie - love the colours you have used. Love both sides, the front for its grungy feel with lots of interesting textures and the back for its delicate stencil effect. Lots of texture on there!! Fantastic. Gorgeous!! the front and the back too!! Lovely texture and colors.